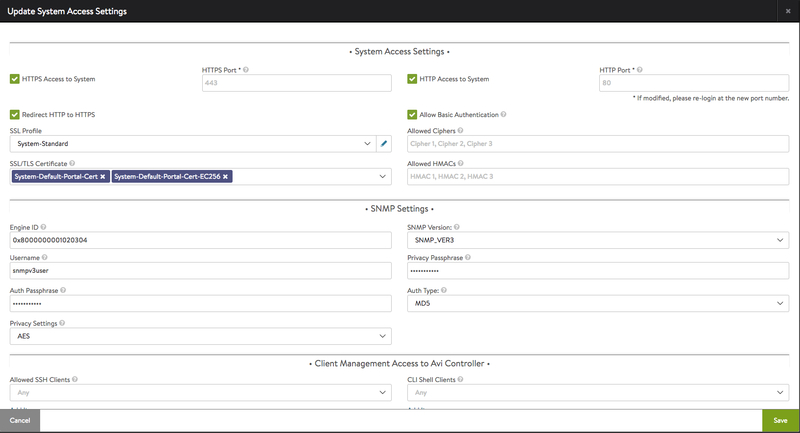 Avi Vantage supports SNMP v2c, and as of 17.2.3, the administrator can choose to use SNMP v3 instead. SNMPv3 support only enables user authentication with the server and payload encryption for the messages exchanged with the Avi Controller. The MIB file, AVI-NETWORKS-MIB.my, is the same for both SNMP v2c and v3 implementations, and is available for download at the following location: https://github.com/avinetworks/sdk/tree/master/mibs. It contains a description of the Avi Vantage SNMP configuration objects and notifications. Alternate download locations for MIBs are listed at the end of this article. This article shows the MIB definitions for the Avi Vantage objects and the definitions for the notifications (traps). An example of how to configure a custom alert based on an SNMP notification also is provided. To fetch SNMP objects from Avi Vantage, an external host needs to query the SNMP daemon, which only runs on the Controller cluster leader. It is therefore best to configure the external host to direct queries to the cluster IP of the Avi Controller cluster. Absent a cluster IP, the external host must know the IP addresses of each Controller, and try as many as three times before it finds the current leader’s SNMP daemon. Firewall rules should be configured to give that external host access to port 161 on the cluster IP or each of the Controller IPs. During the brief period of time (1-4 minutes) that a Controller cluster is recovering from the failure of its leader, queries to the cluster IP will fail, which the external host may interpret as “Avi Vantage is down.” That is only true in the narrow sense that the control plane is down; the data plane (i.e., the SEs) are likely up and delivering virtual services to clients. 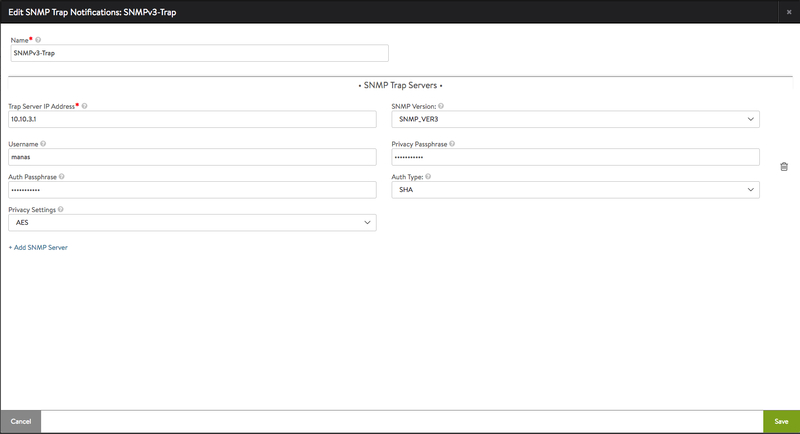 To configure the community string for SNMP polling, log into the UI and navigate to Administration > Settings > Access Settings. Click on the edit icon. Enter the relevant community string under SNMP Community in the SNMP Settings section. 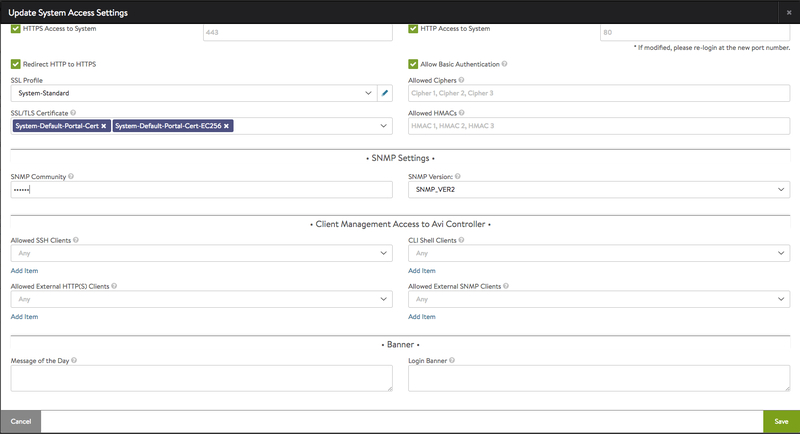 You can configure the common system parameters (e.g., sysName, sysLocation and sysContact) in the Avi Vantage Platform. In a Controller cluster, sysName is configured for each Controller node as the node name in the Cluster object. sysLocation and sysContact are specified in SystemConfiguration object. Because the SNMP configuration is specified at the SystemConfiguration object level, it applies to all clouds overseen by the Controller cluster. Note: In the three REST API examples that follow, for sake of brevity, we have excluded the portions of the PUT that apply to aspects of the system other than SNMP. Their absence is indicated by a series of three vertical dots. Note: No SNMP version number parameter is present (or needed) in configurations of Avi Vantage 17.2.2 Controller clusters or prior, as SNMP v2 is assumed. "community": "public", "sys_location": "San Jose, CA"
Note: With Avi Vantage 17.2.3 and thereafter, if other than SNMP v2 is desired, the version parameter must be explicitly included. It is explicitly set to “SNMP_VER3” in the below example. The possible values for auth_type are “SNMP_V3_AUTH_MD5” and “SNMP_V3_AUTH_SHA”. The possible values for priv_type are “SNMP_V3_PRIV_AES” and “SNMP_V3_PRIV_DES”. The “snmpv3user” and “0x8000000001020304” values are merely representative of what would appear for the username and engine_id parameters. Since the leadership role can change from time to time, the external SNMP server should be configured to allow traffic from any one of the three Controllers in the cluster, i.e., all three addresses should be in the SNMP server’s allowed-access list. The firewall rules should be configured to allow UDP traffic destined to port 162 on the SNMP trap server from any of the three cluster member’s IP addresses. 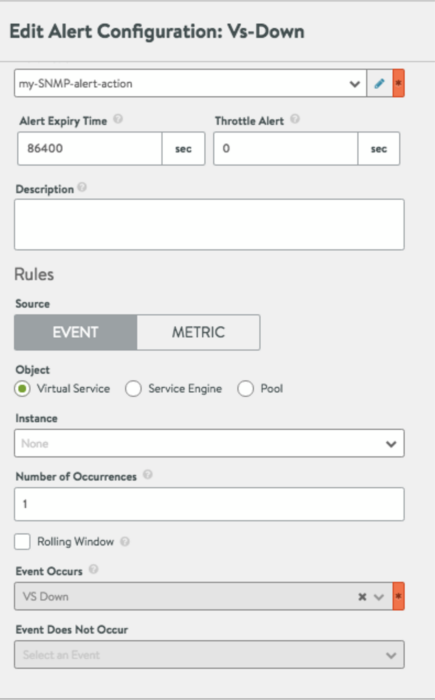 System events related to the Avi Controller cluster, Avi Service Engines, virtual services and SSL certification expiry can be classified into their respective SNMP traps. Other system events use the generic SNMP trap notification to generate traps. Only the alerts generated for the following events are fed into the specific SNMP traps. aviSystemAlert is a generic trap notification and can be associated with any of the system events generated by the Avi Controller. Avi Vantage release 17.2.13 supports large trap payload (a maximum of 4096 bytes) in SNMP trap notifications. Prior to this, the length of the SNMP trap payload was restricted to 256 bytes. This trap is generated when the Avi Controller status changes. For each of the above Avi Controller status-change events, there is a default system alert configuration and for it a default alert action. This trap is generated when the Avi SE status changes. For each of the above Avi SE status-change events, there is a default system alert configuration. This trap is generated when the virtual service status changes. 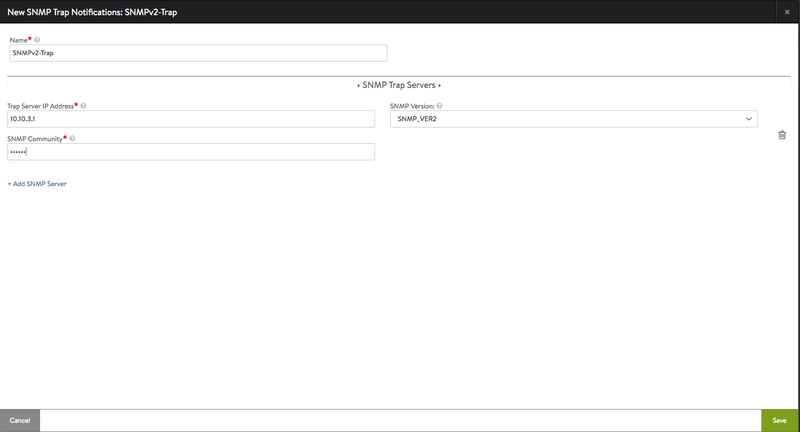 To configure SNMP traps for the Avi Controller status-change events, click here. This trap is generated when an SSL certificate expires. The virtual service Ssl-Cert-Expire event can initiate the aviVirtualServiceStatusChanged trap. "This is a generic system alert"
This is a generic trap notification. It can be associated with any of the system events generated by the Avi Controller. 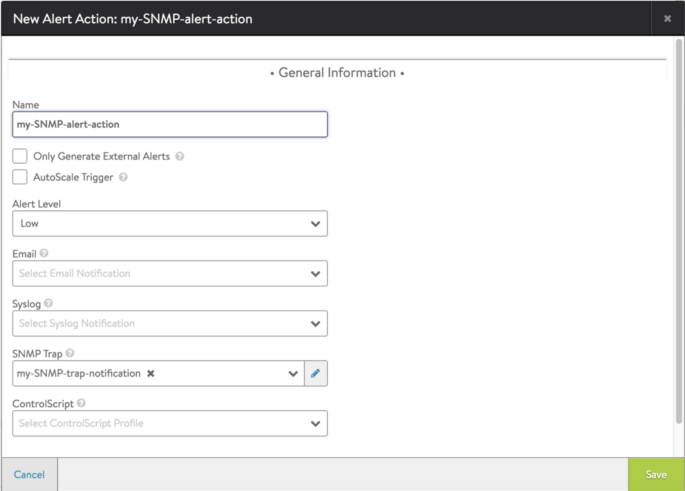 In the following example from the Avi Controller web interface, the Vs-Down event is shown associated with a new alert action named “my-SNMP-alert-action.” The default alert action System-Alert-Level-High could be modified instead. However, it is best practice to leave the system default alert action unchanged, and instead create a new, custom alert action. The named notification is defined in the notification editor. The above UI screen has evolved for Avi Vantage 17.2.3+ as shown below.